Scroll to the bottom to check out our amazing GIVEAWAY!! Breakfast should be healthy, filling and exciting every morning of the week. 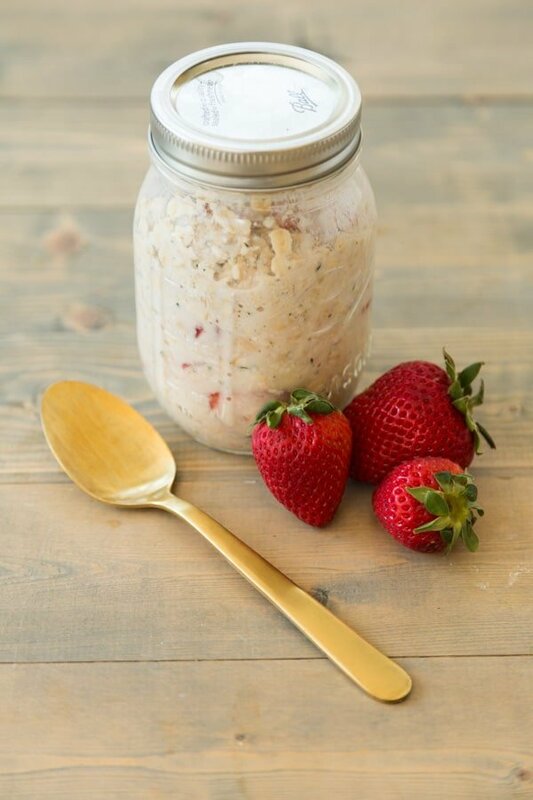 Our simple to make overnight oats with fresh strawberries and peaches is all that and more. Make them the night before and you’ll have a delicious meal to eat as soon as you wake. GIVEAWAY ALERT! SCROLL TO THE BOTTOM OF THE PAGE TO LEARN ALL ABOUT IT! This is not a sponsored post. Veganosity was not compensated for the giveaway and all opinions are our own. 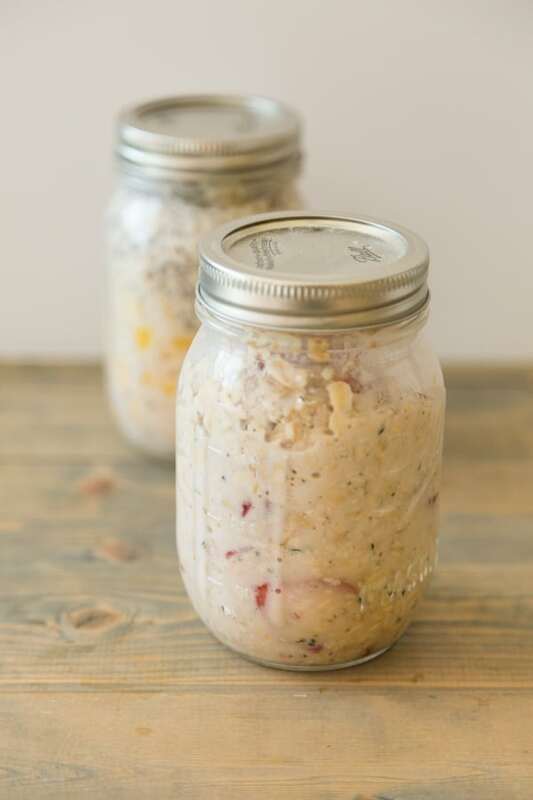 Okay, we know that we posted an overnight oats recipe a few weeks ago, but we believe in the power of breakfast, so here’s another one to spice up your mornings. 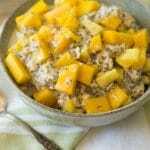 The last one was a tropical medley, filled with coconut, pineapple and mango, this vegan overnight oats recipe is an American summer treat. 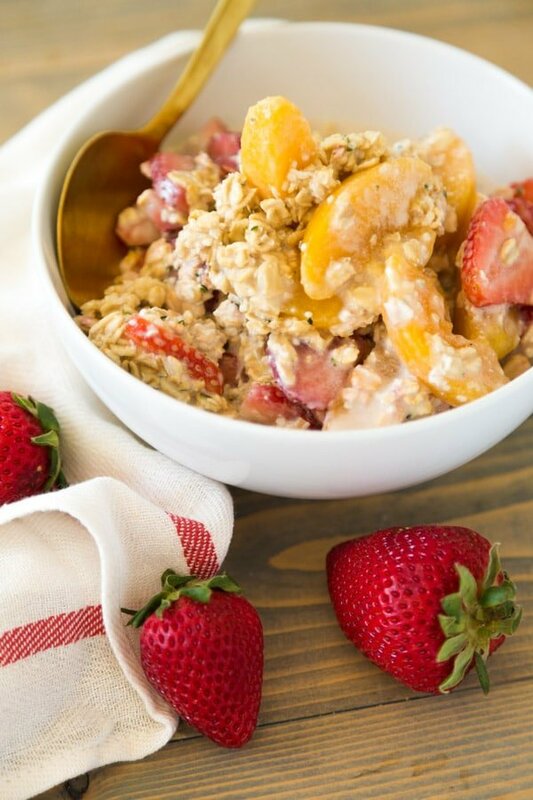 Fresh strawberries and peaches are the stars of the show in this delicious breakfast oats recipe, and we know that you’re going to love it as much as we do. 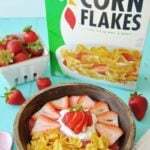 If you read the post we published two weeks ago, you know that we talked about why breakfast is the most important meal of the day and why you shouldn’t skip it. 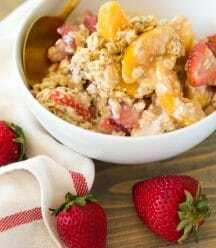 Go ahead and read it if you haven’t, then come back and find out how to make these fruity overnight oats. All right, now you know why you should eat breakfast. You also know why you should only eat a healthy breakfast that won’t hype you up and then send you crashing into the ground. 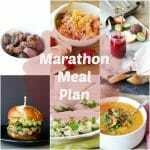 Now let’s talk about why variety is the spice of life, and why preparing healthy breakfasts that taste good, fill you up, and keep you energized will help you succeed in life. When Alex and I tell people that we’re vegan, we get one of two questions. Where do you get your protein? What do you eat? If you’re vegan, you probably get that a lot too. If you’re not vegan, we understand why you might wonder. We have been raised to believe that you can only get “good” protein from animal products. Big agriculture and our government has drilled it into our heads that milk does a body good, that you need it to ensure that you get enough protein and calcium. We’ve also been brainwashed to believe that if you want to be strong and build muscle, meat is the only way. This is so not true. However, we’re not going to talk about protein and calcium today, although this recipe has plenty of both. Today we’re going to talk about making breakfast fun and flavorful. We want you to wake up excited to eat something that’s really good for you. This leads us to the other question that we get a lot. What do you eat? Vegan food is just food. Fruit, vegetables, grains, nuts, seeds, beans and tofu are vegan. When you combine two or more of them with spices and herbs, you can make some pretty good stuff. For example, toast some bread and smash some avocado on top, then add some greens and tomato. All of sudden, a slice of bread, an avocado, and a tomato go from three random pieces of food to one crazy delicious food trend. Healthy food that’s not boring! 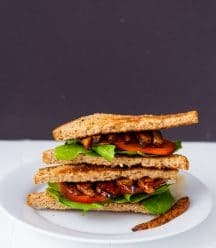 Take a look at this blog post for some tasty toast combinations. The same goes for oats. Let’s be honest, plain oatmeal will get boring really fast. That’s why you need to shake up your morning oats with a few more ingredients that will make you look forward to eating breakfast. 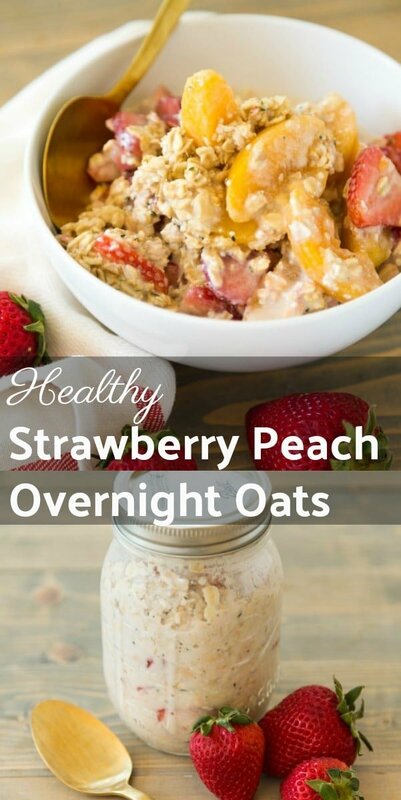 Our Strawberry Peach Overnight Oats are definitely worth waking up for. And the best thing is, you don’t have to cook them. Who’s happy now? 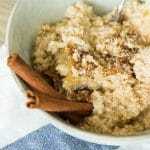 WHY DO YOU SOAK THE OATS OVERNIGHT INSTEAD OF COOKING THEM? Soaking the rolled oats overnight softens them and lets them absorb the flavors of the rest of the ingredients. The oats will have a nice chewy texture and compliment the sweet fruit and the crunchy hemp hearts. You could even add nuts or seeds if you’d like. It also makes life easier and keeps you cool in the warm summer months. HOW LONG CAN YOU LEAVE OVERNIGHT OATS IN THE REFRIGERATOR? As long as you store them in an airtight container, such as a mason jar, you can leave them for up to five days. Do this especially if you like creamier oats. Helpful tip: prep for the week and make five at a time so you have breakfast ready to go Monday – Friday. Because we want you to be as healthy as you can be, we’ve teamed up with award winning chef, Mark Reinfeld, co-founder of Vegan Fusion. He’s so excited about our cookbook and what we’re doing to help our readers cook healthy whole-food recipes, that he reached out to ask if we’d like to work together to give you even more recipes and cooking skills. 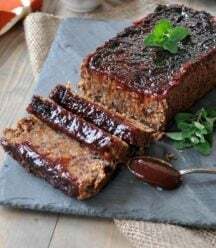 Chef Reinfeld is on a mission to bring vegans, non-vegan, veg-heads, and everyone in between recipes to help them see how easy it is to be vegan and to live their best life! You can read more about him by clicking here. Of course, we jumped at the opportunity! 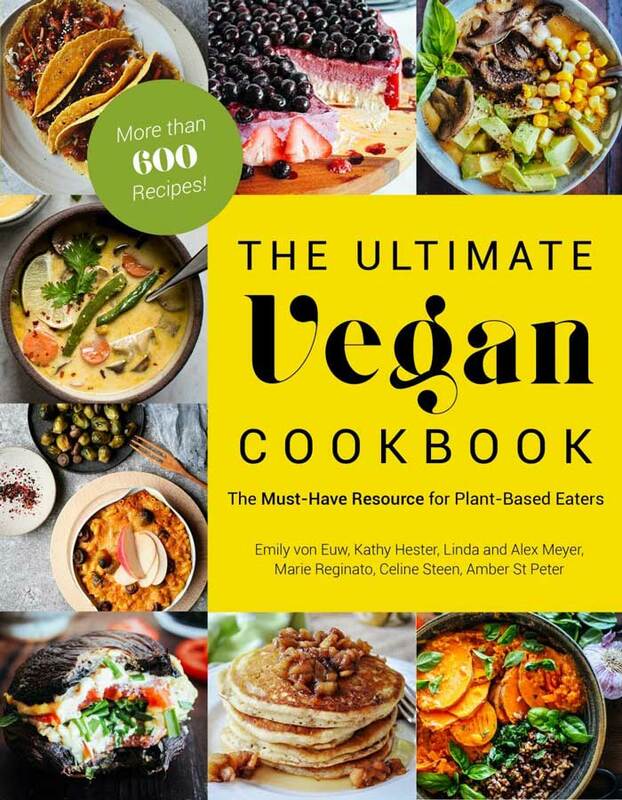 We’re all about promoting a healthy plant-based lifestyle and we’re so excited for one of our readers to get the opportunity to learn even more about it. 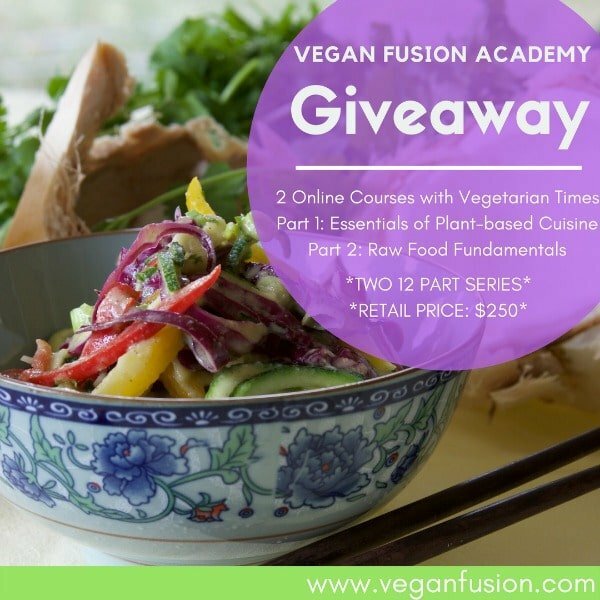 So, they’re hosting this giveaway so you can win a free membership to TWO online courses with Vegetarian Times: Part 1: Essentials of Plant-based Cuisine & Part 2: Raw Food Fundamentals!! 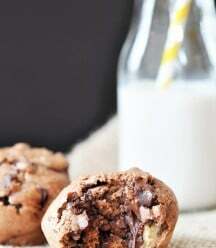 This is an online cooking class taught by Chef Reinfeld worth $250.00! To enter, just follow the prompts below. Good luck! 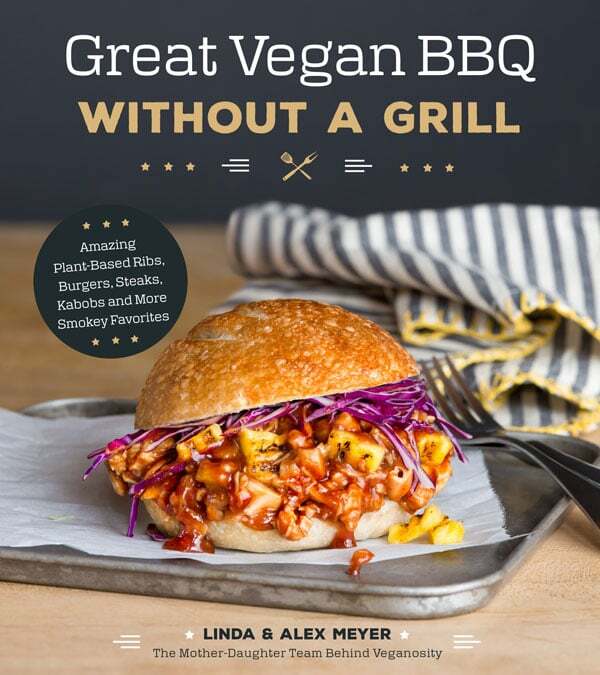 And, if you want to win a copy of our cookbook, Great Vegan BBQ Without a Grill, go like Vegan Fusion’s Facebook page and enter their giveaway!! Click here to enter. 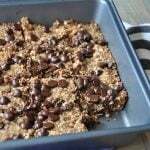 An easy, healthy and delicious way to eat oats. Filled with fresh strawberries and peaches, plus rolled oats and hemp seeds for omegas. Combine all ingredients in a mason jar and store in fridge overnight. The Nutrition Facts are an estimate only. Let’s connect! Hop on over to our Facebook page and give it a like, and follow us on Instagram and Twitter, and follow us and share this and other Veganosity recipes on Pinterest. We’d be so grateful if you did. 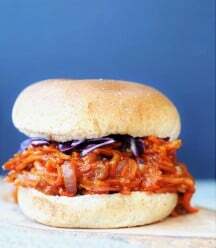 If you like this recipe and can’t wait to see what we’re going to share next, subscribe to Veganosity. Just fill in the subscription box above our picture in the top right corner of the page. 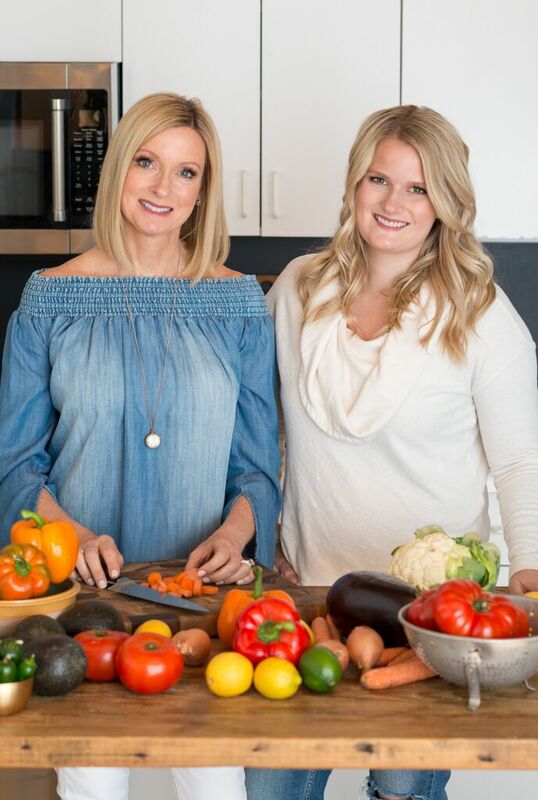 And, Alex and I love hearing from you, please leave a comment and let us know what you think of our recipes. 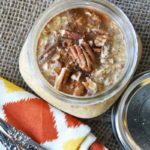 Pumpkin Pie Overnight Oats – Vegan and Gluten Free! Consult your doctor before trying any of our favorite fitness work outs. We are not responsible for any allergic reactions, weight gain, weight loss, or other physical issue that may result from making our recipes. Please do not use our pictures or recipes unless you ask our permission. Thank you! This looks wonderful, never added hemp hearts to oatmeal. Thanks! Thank you! Oh, you should try it. They add so much crunch, and as you know, omegas and protein.